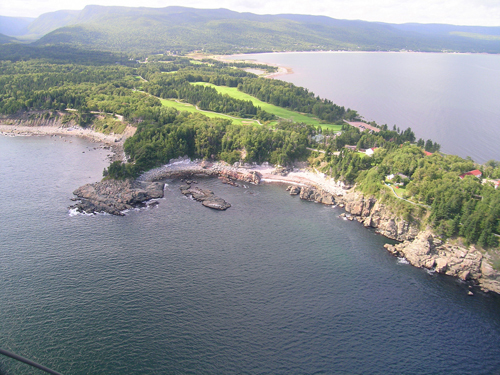 Twelve years ago, Graham Cooke completed a $4-million renovation of the venerable Highlands Links Golf Club in remote Ingonish, NS. The course, which was always splendid, was held up as the best in Canada, and Cooke used the success to extensively market himself. Unfortunately what he did (along with assistant designer Steve Miller) was a poor imitation of designer Stanley Thompson’s work — oval bunkers replacing existing ones, new tees being added in odd spots (like those behind the third green for the fourth hole Writer’s note — thanks for the correction, Joe), litte attention to drainage and generally ignoring the myriad of historical documentation that existed in pictures and by longtime club members like Joe Robinson. Regardless, someone had the audacity to add Cooke’s name as a designer of the club alongside Thompson in Golf magazine’s Top 100 in the world in 2005 (that said, Cooke’s addition of a new tee on the all-world par-5 sixth is smart). Despite this, the club had fallen in disarray. Tee boxes only constructed 12 years ago, look like they haven’t been altered since the 1950s. One fellow architecture afficianado said they resembled “Donald Ross greens.” Ouch. Tree clearing was not accomplished properly, limiting light and air flow. Thompson’s wonderful and often elaborate bunkers were turned into simple shapes, taking much of the art out of the course. Course maintenance, always complicated by Highlands being part of the Parks Canada system and its linked unions, was uneven and often disappointing. “This is among the Top 100 courses in the world?” regular vistors could be overheard as exclaiming when they hit the bald ninth green, the end of a brilliantly designed hole. Regardless, the course had bones that were breathtaking. For example, there’s the remarkable second hole, a tremendous test of golf despite not a single bunker; the back-to-back brilliance of the sixth and seventh — par-5 holes that rival anything in the world; the incredible short 4s of hole four and eight; and the amazing 15th, with its view of the ocean comparable to few holes in the world. As regular readers know, I’ve been interested in Stanley Thompson and his courses for many years. He’s unrivaled in Canada, even with the emergence of Doug Carrick, Rod Whitman and Tom McBroom. And when Ken Donovan, a Cape Breton scholar who has a particular interest in Highlands Links and Thompson, asked if I’d come to a symposium on the designer and present a talk, I was quite keen. What would be the worst to happen? At least I’d get to play Highlands again. On Tuesday I flew into Nova Scotia with golf designers and fellow presenters Jeff Mingay (who works with Rod Whitman) and Ian Andrew. There we met Lorne Rubenstein, who was presenting the keynote recap, and Bill Newton, executive director of the Stanley Thompson Society. The talk was scheduled on Wednesday, but that gave us the great option of hitting Highlands for a round as soon as we arrived — which is exactly what we did. We found Highlands in difficult condition after a long, wet summer. The occasional green was threadbare, lacking grass. Wet patches were everywhere. Trees had overrun many areas of the course, sucking the light needed for thick, firm turf. The course was still great — but it felt tired and worn. Any good done by the renovation had long since disappeared. I was concerned, but was also aware that finally there was once more talk of a proper restoration — one that paid careful attention to the evidence. Turns out that Andrew had been handed the reins to start the planning for a history-based restoration of what may be Thompson’s masterpiece. Andrew has done plenty of impressive work at places like St. George’s, Kawartha, St. Thomas, and more recently in the U.S. after leaving Doug Carrick’s office a few years ago. No guarantee that the restoration will go forward, but it appears more likely than I anticipated, with Andrew, Clifford, the course’s super, and long-time pro Joe Robinson wandering the course yesterday marking trees to be cut. It is a huge first step and I’m hopeful it’ll lead to the decision to fund a real restoration. As Lorne Rubenstein said to me while we were at a dinner, “It really is like Dornoch.” Rubenstein was referring to all of the Ingonish area, but he was also including the course. A restoration could move Highlands — currently ranked 79th of the more than 30,000 in the world by Golf magazine — to an even more illustrious place. It is Canada’s prize, our greatest accomplishment in golf design, and should be celebrated. A restoration would take government funds — but I’m sure Ottawa pisses away more than the than the needed funds without a second thought. I’ve been thinking a lot about the course, its place in Canada, its importance Cape Breton and Ingonish, and just how remarkable it is. I’ll write about it more in coming days, including my comments on the symposium and where Highlands could go if Andrew is allowed to go forward with an appropriate plan. RT, hope you, Lorne and the rest of the group enjoyed your visit despite the course being in rough shape again. I am fascinated by the news that Ian Andrew may be able to oversee a proper renovation — it certainly deserves one. Looking forward to hearing more from you on this gem. Here’s hoping the proper restroration comes to fruition. It will be a pretty massive undertaking…as it stands now most of the Thompson details, particularly the bunkering are spotty at best. And the conditioning has got to improve (the same can be said for Banff and Jasper). The real question is. Do they (Parks Canada) have the desire to do it right? Enjoyed your succinct and and thoughtful comments on Highlands Links. Just wanted to correct your recollection – the new tee built by Cooke was behind the third green and not the second. A minor detail but thought some readers may be confused. Your concern for Highlands Links is shared by many who would be delighted to see Highlands Links truly restored to the original Thompson standards. I believe in the power of the pen and having devotees such as yourself and Lorne bringing attention to the situation is encouraging. Many thanks and best wishes. How much cost would a full restoration cost? Also, how much has to be undone from the initial so-called restoration, in terms of bunkers, tees etc and I am curious what the cost of undoing that is. Have heard that almost $1 million will be spent on latest renovation. Also heard that a lot of that was going to be spent on paving the cart path which in my mind would be a waste of money. I believe that all of it should go towards bunker restoration, tree removal and irrigation. I imagine a lot of the things inflicted on the course by Cooke will need to be undone. That man should not, IMO, be allowed anywhere near a golf course except to play it. I played his Glen Arbour course in Halifax earlier this week and it is always an ordeal that I never wish to subject myself to — but it has become tournament city so there are a lot of corporate events there to which I get invited. I always wonder what another architect would have done with that site. Getting back to HL, I fail to understand why sandy/pebbly cartpaths would be considered inferior to asphalt — after all, it’s not like they need to be snowplowed in the winter. we had our back nine done by graham cooke in nl and im not very impressed by what we got. Designed a resort type course with a links type course that was already there. All good questions — George: Jury is out on Parks Canada, though I received some positive encouragement. Joe: Thanks for the correction — you da man. Don, etc: Cost? Who knows — tees need redoing, bunkers need to be restored, lots of drainage, tons of trees need removing. $2M? $3M? I guess it depends on who does the work — ie. union or outside contrators. Robert I have nothing but hope that this course will be turned around with a comprehensive restoration. It has the potential to be a top 5 course in the world . It shows the wear of a neglected Victorian home. It needs Andrew to rebuild it from the ground up. He needs full control of all staff and the control to train and teach the management how to run a world class turf team. The current Parks Canada management needs to step aside and let Andrew rebuild their future. Highlands Links is a jewel , I think it belongs to the people of Cape Breton and Parks Canada will be rewarded ten fold when they give Andrew a blank check and tell him to START NOW. While Andrew might be qualified to participate in a “restoration” he definitely has no experience to have “full control of all staff and the control to train and teach the management how to run a world class turf team”. I have spent quite some time at HL and it will take quite a bit more than 2-3 million. Remember we all want a 1930’s golf course to sustain today’s demands of play and conditioning. Which means restore the design intent but rebuild do today’s standards. MacPherson writes: full control of all staff and the control to train and teach the management how to run a world class turf teamÃ¢â‚¬Â. The problem here is not the staff but the handcuffs placed upon the staff. The turf team at highlands links, myself included, are a very dedicated and knowledgeable group. We are very aware of all the problems noted in the past days. As far as Union vs Contractor I remind everyone that it was not the union workers who backfilled the irrigation pipes which rock and stones, nor removed the valuable topsoil from the putting green and replaced it with pit run, and definitely not the ones who restored the bunkers without any concern for future maintenance. As far as the cart paths, enough said in these comments, but just a note, we do plow them in May in order to get around the course for maintenance. I do agree that the union situation is not perfect but I am having a real hard time finding a course that has privatized without totally ruining Thompson’s work. I believe it was noted, at the symposium, that the Highlands Links is the only course still with a possibility to be restored to Thompson’s original design. So that is a positive! It is great to hear everyone’s comments and we are all very grateful to the time and effort put into this course by Lorne, Rob, Jeff, Joe and others. Without you we would not be here. The thing to remember here is that years ago golf courses didn’t have to contend with many elements that we do today. Some insects are problems today as back then DDT killed them all, some diseases, as well but mercurials kill the all, a busy day was 50 golfers, less wear and tear, USGA greens spec, height of cut, water quality, etc. I could go on but I hope you get the drift. These are just a few but the point is here we are trying to restore something that its intended use was for years gone by. As you all know, there have been many successful restorations of old golf courses in the States in the last bunch of years but they “modernized them”, kept the design integrity but made them playable today. I hope that explains it for you. Very interesting “news” about my favourite course. In spite of miss-management etc. for all these years, the Highlands is still better than all but two courses built in Canada since the era when it opened.